A large woodpecker, about twelve inches long. Gray head with red patch on the back of the head. Light brown undersides with black or dark brown spots. Black wavy bars on brownish gray wings, yellow bordered wing feathers and yellow under wings. Inhabits forests, groves, farms, and towns from parts of Alaska, throughout most of Canada and the States east of the Rocky Mountain’s eastern slopes and below 55 degrees latitude south to Central America. 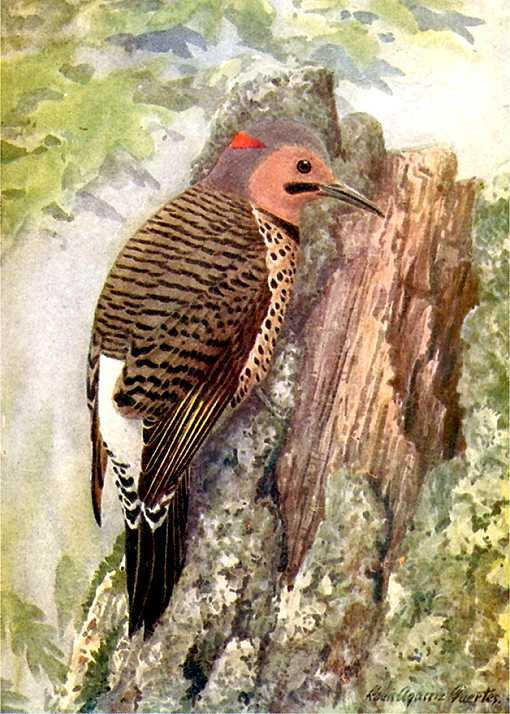 Odd for a woodpecker, the flicker is primarily a ground feeder. It eats ants and other insects, grubs, worms, berries and sour gum fruit. Flicker nests have been discovered in an old wagon hub on the treeless prairie, in barrels, in the crevices of deserted barns and out houses. Chips out several cavities or nests in an abandoned or natural cavity in decaying trees, cactuses, or fence posts from within reach to twenty feet or higher. Absent its usual choices it will use what is at hand. Females lay a varying number of white eggs which hatch after about two weeks incubation and young leave the nest in about another four weeks. 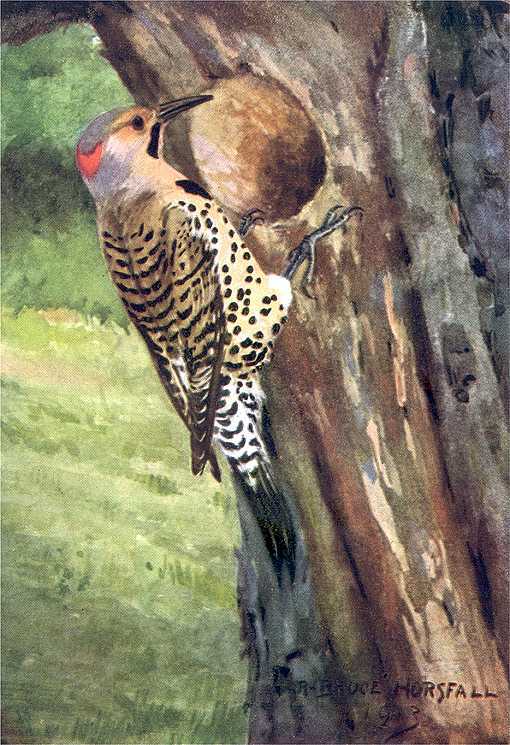 The Northern Flicker Birdhouse (same as for Lewis Woodpecker, Saw-Whet Owl, Pigmy Owl and Grackle) has a 7″ by 7″ floor, 16″ inside ceiling, 2 1/2″ diameter entrance hole located 14″ above the floor and ventilation openings. Mount this nest box on a tree trunk about eye level or just out of reach, higher if desired, in a forest, grove, farm country tree stand or a park where dead trees, their preferred choice, have been removed. Attract flickers to areas with most any berry bush or fruit tree, especially bayberry, choke cherry and sour gum. A large woodpecker, about twelve inches long. Gray head with red patch on the back of the head. Light brown undersides with black or dark brown spots. Black wavy bars on brownish gray wings, yellow bordered wing feathers and yellow under wings.